Only four of The Associated Press’ 50 highest-paid employees in the editorial unit are people of color, according to an analysis by the News Media Guild. 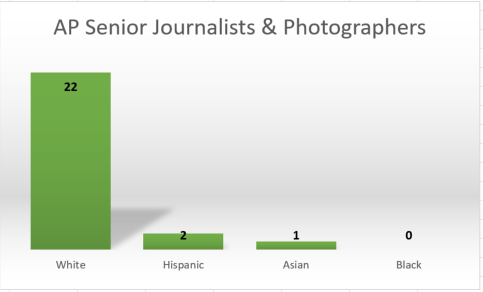 A News Media Guild study found there are no black senior journalists, and only three who are people of color. The Guild studied the pay of nearly 900 workers in the editorial unit with all employee names redacted. It included everyone eligible for Guild membership. The analysis did not include hourly workers and did not include overtime, economic differentials or any other additional pay beyond the weekly base rate. The Guild’s study reflected a dearth of diversity at the highest-paying jobs within the bargaining unit. Forty-six of the 50 highest-paid bargaining unit jobs belong to white employees, and there are no black senior journalists, a high-profile position that pays at least twice as much as typical newsperson jobs. “More than 90 percent of the top 50 earners in the bargaining unit are white. AP needs to make it a priority to hire more women and people of color for these high-paying, high-profile jobs,” said Jill Bleed, a Little Rock-based breaking news staffer and Guild vice president who conducted the analysis. Of the top 10 highest salaries in the bargaining unit, all belonged to white employees. Three are women and seven are men. White men were the highest-compensated subgroup based on average weekly salary. Black women were the lowest. On average, a white male earned about $15,000 more annually than a black woman, though that does not factor in differing job titles or years of service at the AP. Women make up just over one-third of the nearly 700 newsperson jobs studied by the Guild. On average, a male newsperson earns about $2,700 more annually than a female newsperson, but that again does not factor in years of service at the AP. Diversity among photographers is still a problem. Nearly 90 percent of photographers are male, and most are white. “We know that the AP has few black employees, but it’s hard to imagine that none is deserving of being senior journalists, especially since the contract doesn’t limit the number of staffers who get that title,” said Guild President Martha Waggoner. A Guild examination earlier this year of hiring by the AP shows that of the Class A employees working 15 or more hours a week, 83 percent are white; 6.7 percent Hispanic; 4.9 percent Asian; and 4.5 percent black. In a meeting in June with the Guild’s diversity committee, the AP addressed the issue of minority hiring. The Guild had not analyzed pay disparities, so the AP and the committee didn’t discuss that issue. Brian Carovillano, AP’s vice president for U.S. News, said AP needs a path into the company for all diverse candidates and a path within the company to move around geographically. “Both have been tough,” he said, noting that AP hasn’t done a lot of hiring. The Guild is working on an analysis of the technology unit.